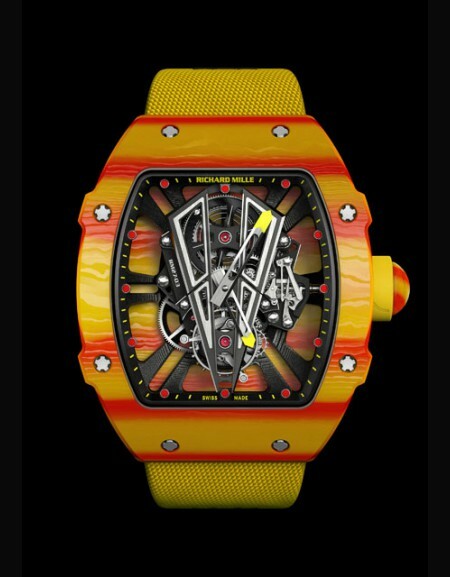 Price request for RM 27-03 Tourbillon Rafael NadalRef. 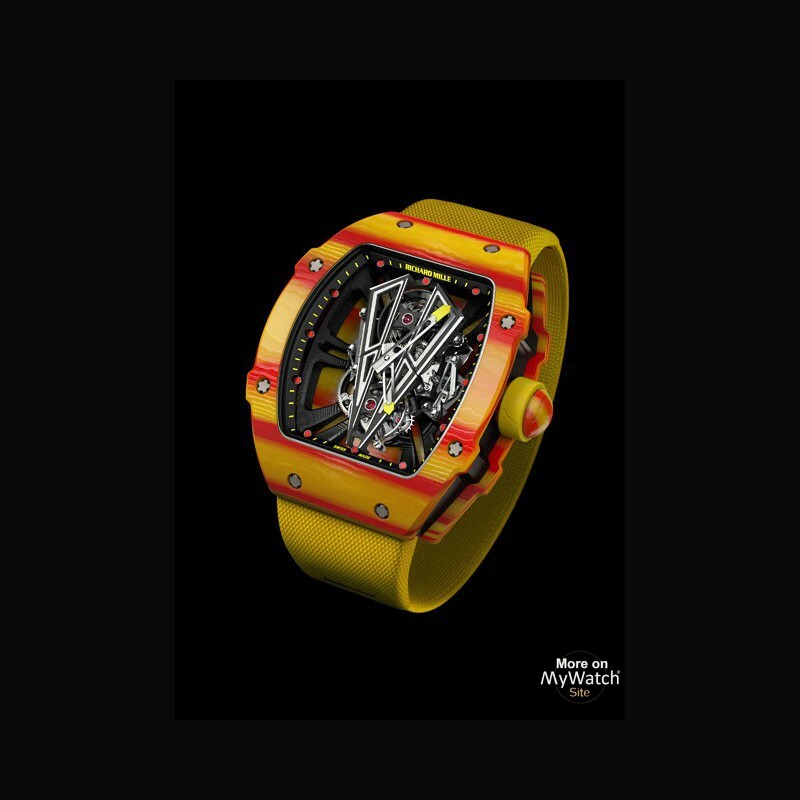 The front and back bezels of the RM 27-03 are made from Quartz TPT®, a groundbreaking new material designed and developed by Richard Mille in partnership with North Thin Ply Technology. Quartz TPT® is composed of over 600 layers of parallel filaments obtained from separating silica threads. 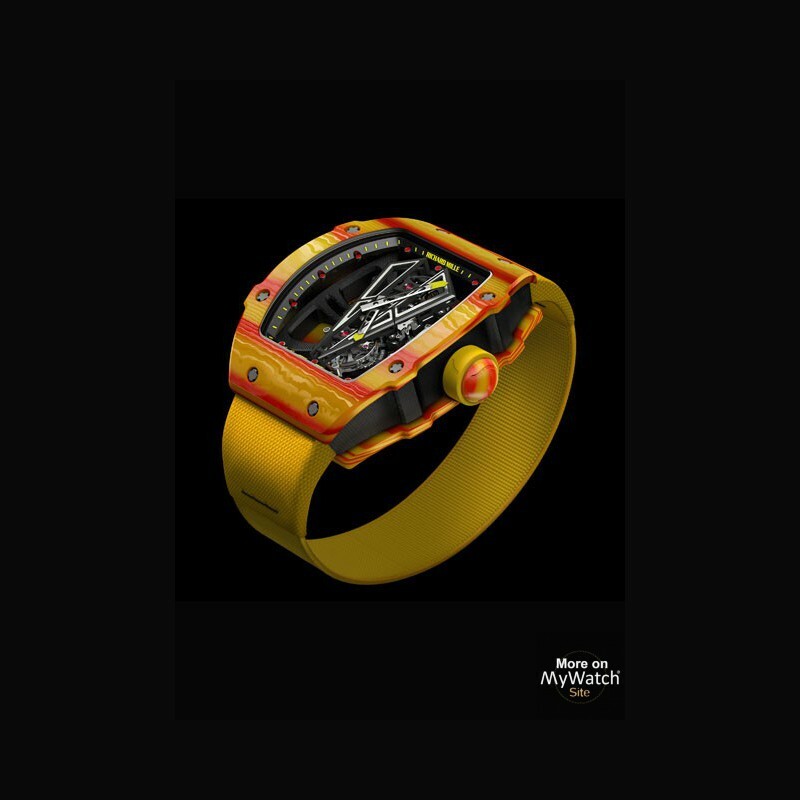 These layers, no thicker than 45 microns, are saturated in a white resin developed specially for Richard Mille, then inserted between layers of Carbon TPT® using an automatic positioning system that changes the orientation of the fibre between each layer by 45°. 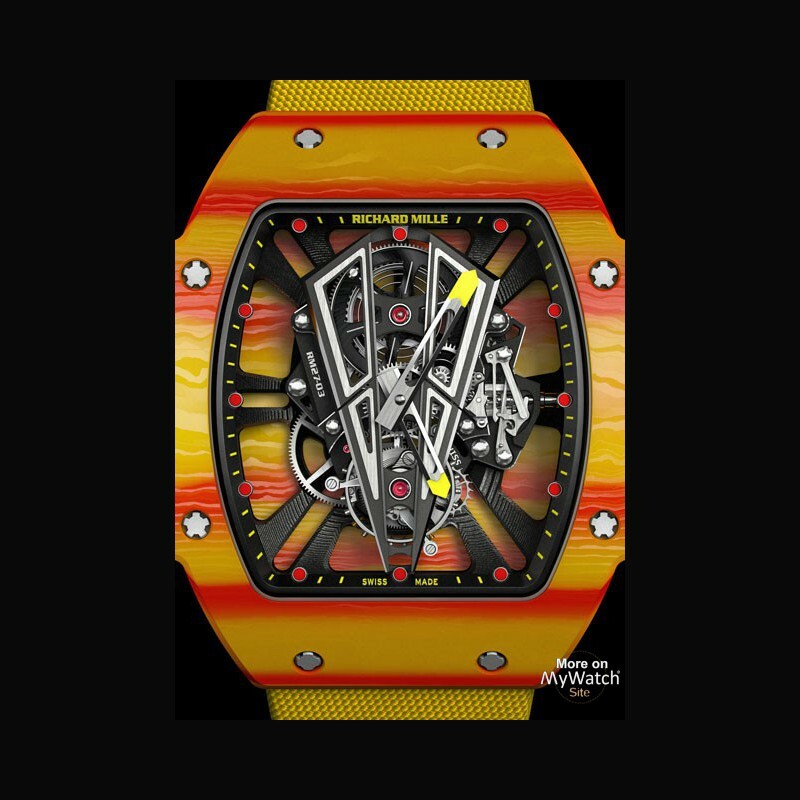 It is then heated to 120°C and subjected to a pressure of 6 bars in an autoclave similar to those used to make aeronautical components, before the material is ready for machining on a CNC machine at Richard Mille’s manufacturing facilities. Machining unveils the various Quartz TPT® layers at random, ensuring that each machined part is unique. Quartz fibres are generally used for very high performance applications due to their resistance to high temperatures and their strength. The complete case construction is water-resistant to 50 metres thanks to two Nitril O-rings, is assembled using 12 spline screws in grade 5 titanium and 316L stainless steel washers. 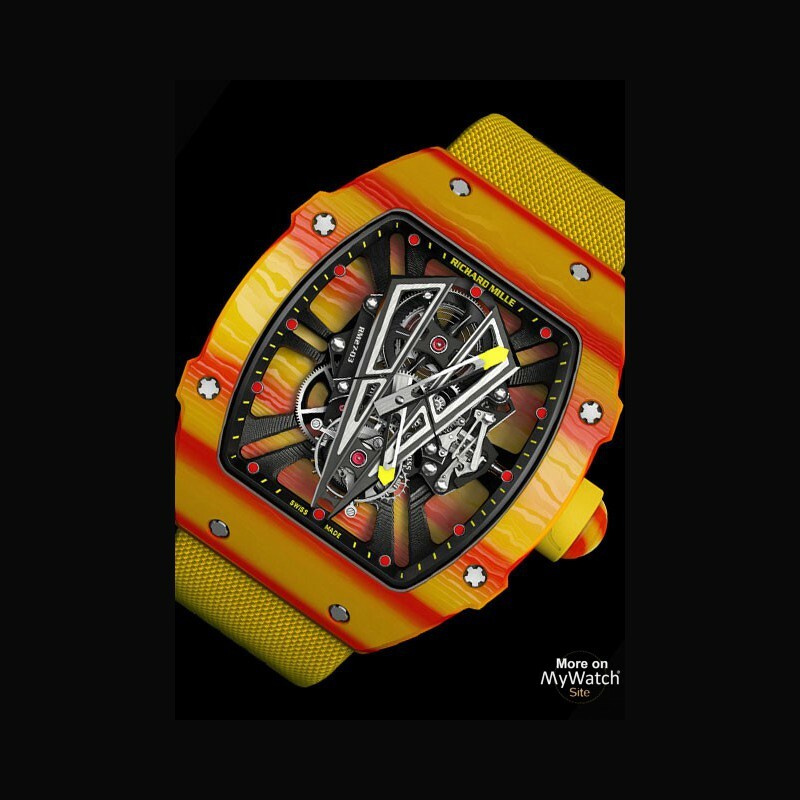 Likewise, this new watch reconciles innovations at the level of materials with a testament to horological architecture. Clay courts are known for amplified effect. 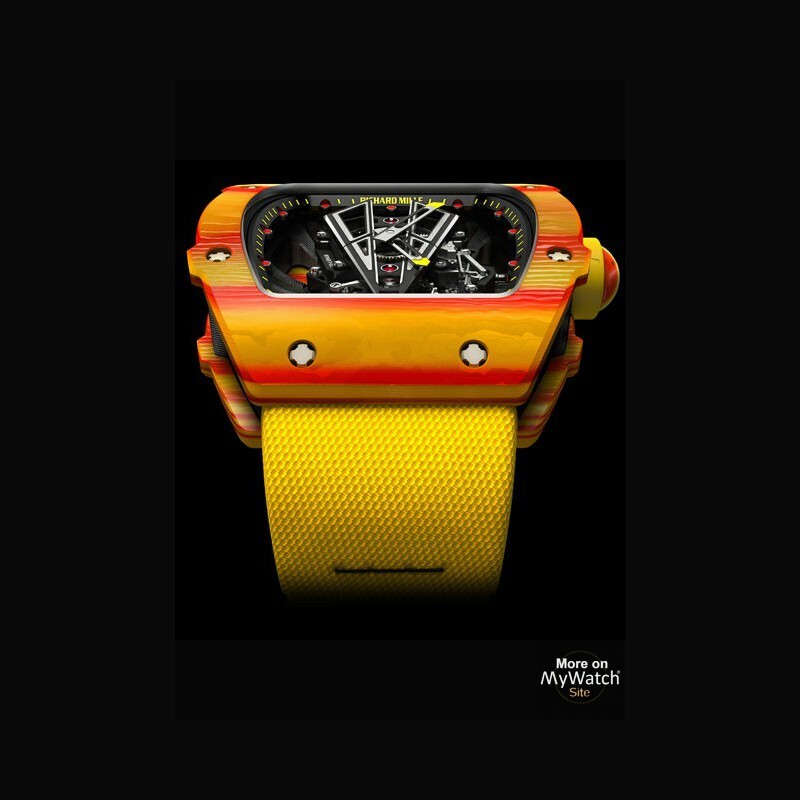 You might say the same of the RM 27-03, given the striking red and yellow hues of its Quartz TPT® case that pay homage to Rafa’s native Spain. The intense burst of colour is achieved by impregnating fine layers of silica just 45 microns thick with tinted resin according to a proprietary process developed in Switzerland that stacks the filaments in layers before heating them to 120 °C. 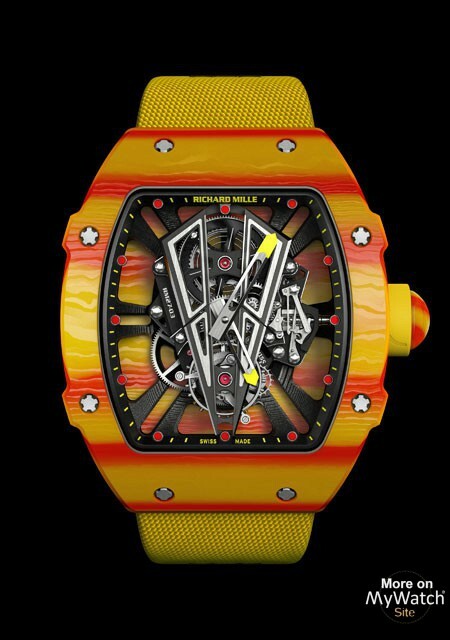 When it comes to releasing a new shade of Quartz TPT®, achieving colour stability compliant with REACH standards while resolving issues of biocompatibility and durability represents a tremendous display of prowess on the part of the engineers at Richard Mille and North Thin Ply Technology (NTPT®). And once the composite is produced, there remain many hours of milling and finishing operations to produce the case and components. The quartz fibres used in this case, which is water resistant to 50 metres, offer a very advantageous strength/weight ratio, as well as being anallergic and highly resistant to UV rays. But the main innovation of this extraordinary watch lies in the capacity of its tourbillon calibre to withstand shocks up to 10,000 g’s. 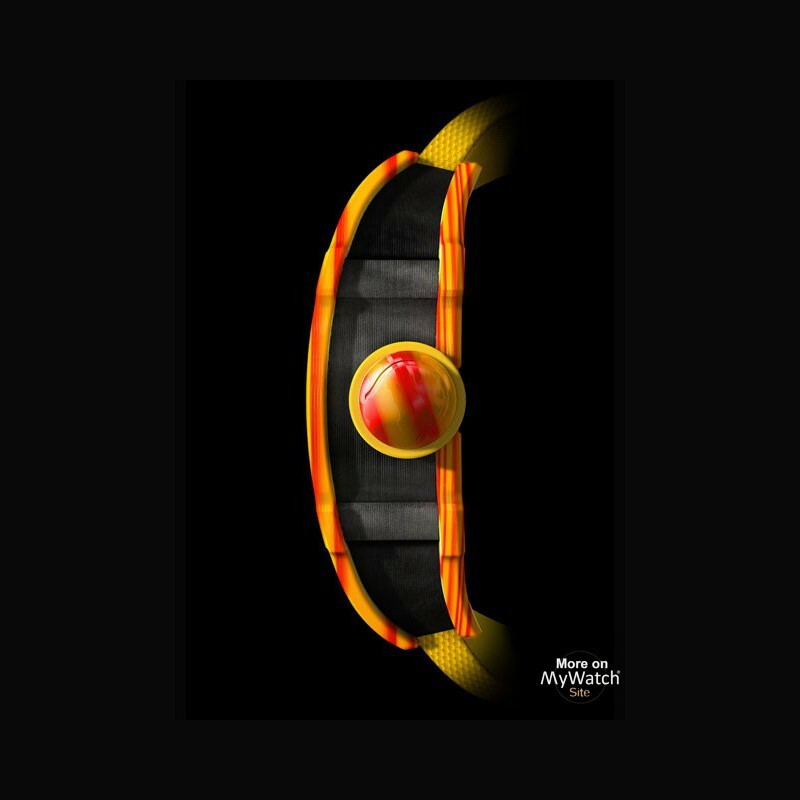 This new threshold has been attained thanks to years of R&D and countless hours of tests, particularly ‘pendulum impact testing’ which simulates the linear acceleration that occurs due to sudden movements or shock to the wearer. 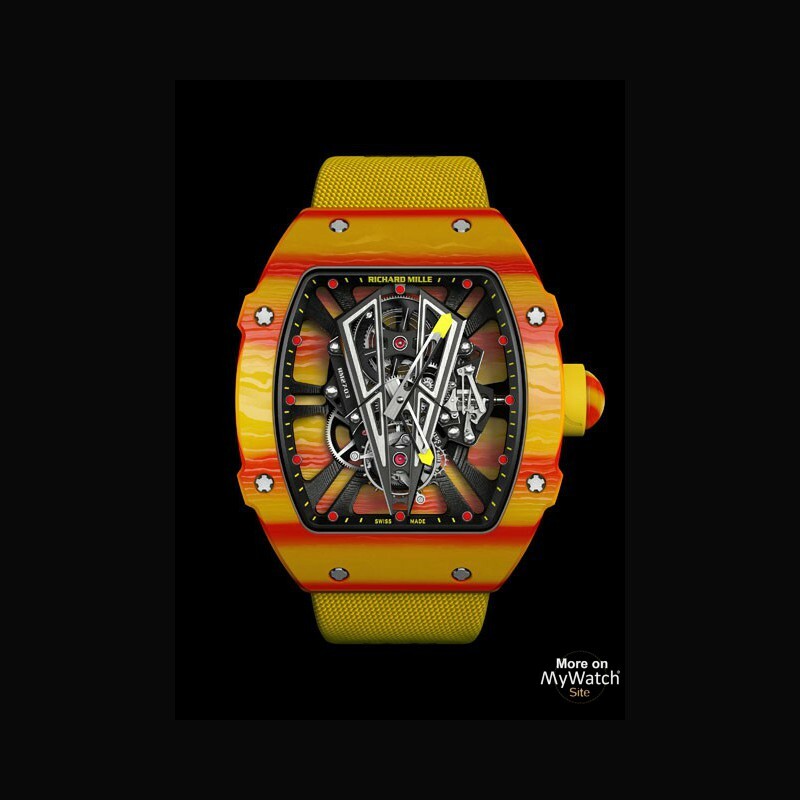 This virtual indestructability is vouchsafed by assembly of the ultralight tourbillon calibre on the skeletonised unibody baseplate of Carbon TPT® with a precision to the nearest micron, while the reduced number of components in this configuration permits additional weight savings, lightening the whole watch. 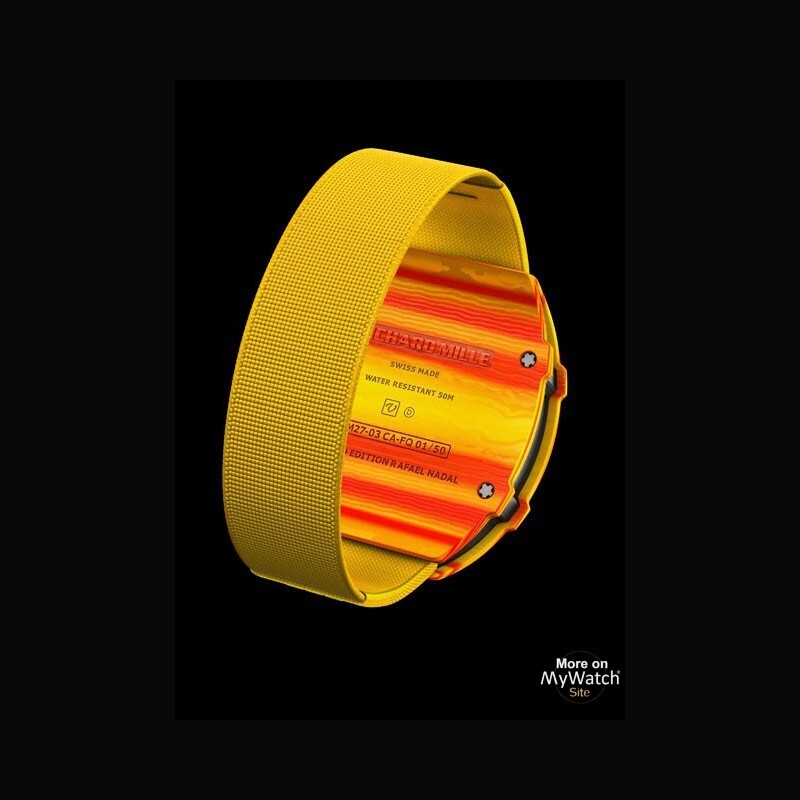 The rapid winding barrel provides an unvarying flow of energy for the full 70 hours of running time.